Our top priority is delivering safe, reliable drinking water to all of our customers. We are committed to making the upgrades to the system necessary to achieve that goal. Some of our improvements are obvious, like removing all lead lines in the city before 2030. But some are less obvious, such as building in intentional redundancy and resilience, so if a problem arises in one area, we can work around it and continue to deliver safe water to residents everywhere. Projects, including replacing the existing Highland-Garfield Pump Station, adding a new rising main to connect the Highland Reservoir service area, and adding new pumping capacity, will ensure an uninterrupted and reliable water supply to over one-third of our customers. The new Highland-Garfield Pump Station will replace the existing pumping station that was used to supply water to the Garfield Tank. It will also provide a supplemental and redundant supply of drinking water to the Highland I reservoir water district. To connect the new pumping station to the Highland I Reservoir water supply system, a new 48- inch rising main will be constructed. The rising main will be near the upper entrance to Highland Park. This project has opened the doors to work collaboratively with the Pittsburgh Parks Conservancy, the Port Authority of Allegheny County, and the City of Pittsburgh’s Department of Public Works and its Department of Mobility and Infrastructure to incorporate park features, mobility improvements, and green stormwater infrastructure to benefit the community. It is estimated to be completed in 2023 and cost $32 million. The existing 60-inch rising main that supplies the Lanpher Reservoir is a riveted steel pipe that is more than a century old. It carries water from the Aspinwall Pump Station to the Lanpher Reservoir and provides connections to critical customers such as St. Margaret Hospital and bulk customers – the townships and municipalities we serve that are outside of the city. In recent years, due to the age of this pipeline, this critical component of our water distribution system has experienced breaks and failures. Providing a new redundant rising main is necessary to ensure the reliability of the northern portion of our water distribution system. It will add resiliency and serve as a primary supply source for the Lanpher Reservoir when we begin the Clearwell Improvement project. This capital improvement project is estimated to cost $49 million. PWSA’s reservoirs and tanks are the backbone of our drinking water distribution system. Located at high elevations, they use gravity to supply the pressure needed to move water throughout a service area. By working with nature instead of against it, our gravity-based system keeps the system simple and energy efficient, reduces the need for pumps, and ensures that we can maintain water pressure even when parts of the city are without power. Our reservoirs also ensure that we have redundancy and resiliency in our system; they allow us to store large quantities of treated water, so if part of the system is temporarily out of service for maintenance, water from the reservoirs can be re-routed to maintain full service. In summer of 2018, PWSA restored 90 million gallons of drinking water storage capacity by completing the major renovations to the western cell of the Lanpher Reservoir located in Shaler Township. This project involved replacing the cover and liner of this critical treated drinking water storage facility which provides water to PWSA’s customers in Pittsburgh’s northern neighborhoods, the Borough of Millvale, and Reserve Township. With the western cell fully restored, PWSA has begun work on the eastern cell. The entire Lanpher Reservoir renewal project includes improvements to the perimeter wall, the gatehouse as well as construction of new metering and new facilities to improve water quality. This capital improvement project is estimated to cost $30 million. Located along the Allegheny River, the WTP draws our water and treats it before its distributed to our customers throughout Pittsburgh and neighboring communities. Still considered a state of the art treatment process, the WTP, like much of the system, has suffered from a lack of investment in recent years. The last major modernization of the Water Treatment Plant (WTP) was completed in 1969. Today, we’re prepared to once again reinvest in this critical water supply facility. PWSA has identified a series of projects that will renew the treatment plant in its entirety by rebuilding its intake facilities, treatment systems including clarification and chemical feed systems and replacement of the century-old 44 million-gallon Clearwell. In addition, PWSA will upgrade its two finished water pumping stations, both more than 50 years old. While the innerworkings of the plant are essential to the treatment and distribution of water, the exterior of the building, its connection to the river, and surrounding environment are also critically important to us. PWSA envisions modernizing the buildings to meet current standards for energy efficiency, utilizing renewable energy, and adhering to industry leading green building standards. We are collaborating with Friends of the Riverfront to extend public trail access through our site to continue the trail system that follows the Allegheny River. 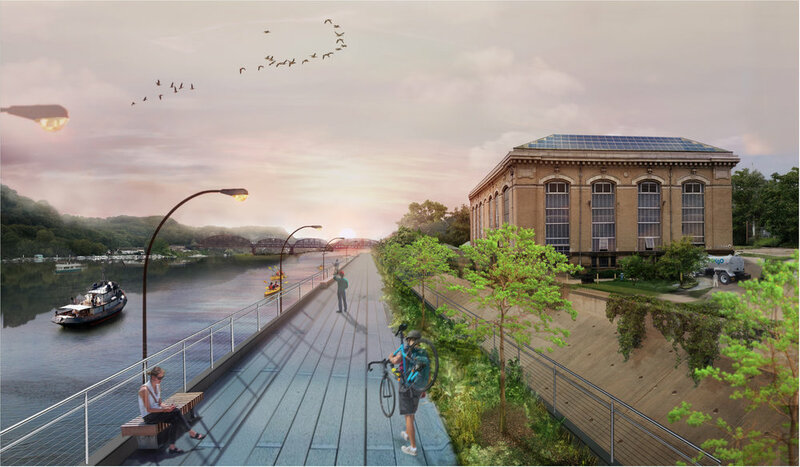 The new water treatment facility will also incorporate a new community mural to highlight the historical significance of the rivers and their importance to Pittsburgh. These projects are in their planning and design phase and will be completed in sequential order to ensure safe and continuous distribution of water. PWSA currently estimates the initial investment to be approximately $120 million. PWSA has approximately 960 miles of water mains with an average age of about 80 years old. More than 40 percent were installed prior to 1920. Given the age of the system, and lack of spending in prior years, PWSA is initiating a water main renewal program. Pipeline condition assessments and overall system prioritization is being formalized. Over the next several years, PWSA will replace small diameter water mains pipes at an annual replacement rate of 20 miles of pipe per year. After that aggressive program, our long term water line replacement program will average about 10 miles per year. This proactive approach to managing the network of pipes that make up our water distribution system will improve system reliability and water quality, reduce breaks, and ensure that our firefighters have sufficient water pressure. It will also reduce water loss and reduce service disruptions. Coordinating water main replacement with other PWSA projects, as well as other utility and City projects, will reduce the overall cost of the renewal program. As such, PWSA is initiating a pipe condition assessment methodology to strategically plan for the renewal or replacement of these critical assets. Those pipes with the greatest risk of failure will be prioritized. Strategically improving small diameter water mains will improve water pressure, maintain water quality, and minimize disturbances throughout Pittsburgh’s neighborhoods. We are focusing on replacing those that are undersized (4” and 6” in diameter), made of unlined cast iron and mains with a history of frequent breaks and/or water quality issues. This is an ongoing capital program. Expenditures will range from $10 million to $40 million per year. PWSA is installing an ultraviolet (UV) disinfection system at the Highland Park Membrane Filtration Plant (MFP) to provide enhanced drinking water treatment that will exceed state requirements and reduce potentially harmful disinfection byproducts. Treating water with UV disinfection is highly effective because UV attacks organisms at the genetic level, rendering them harmless. UV disinfection will also allow the Highland Reservoir 1 to remain uncovered and serve as an amenity to the public. When the project is completed, the MFP will provide up to 26 million gallons of treated drinking water per day. In addition to the UV system upgrade, PWSA is completing security upgrades at the MFP and the Highland Park Reservoir I. Upgrades include improvements to the reservoir wall and 24/7 video surveillance. These projects will be completed in 2019 and will cost approximately $4.3 million.